On Sundays limited parking (2-3 cars) is possible in the Aberwheeler bus stop SJ0961369360 on the B5429. At other times roadside parking is the only option. From the bus stop, facing Bro Lleweni, go left towards the nearby junction and turn left into the lane then, after 250yds turn right. Then stay on the lane to cross the ford at Tyn Y Celyn (SJ1024669206) then continue upwards onto the footpath. 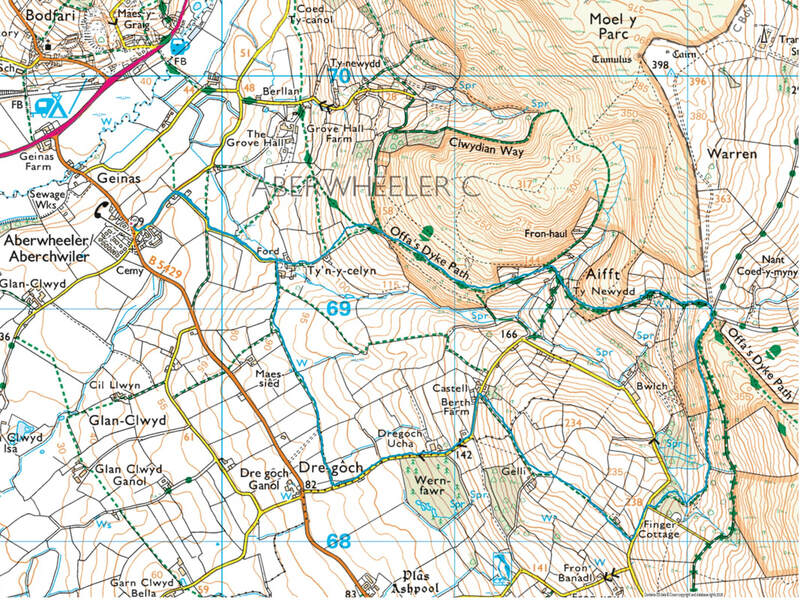 Keep to the hedgeline, for 250yds, then cross the stile and follow Offa's Dyke Path as it rises to the right. After 1 mile the track emerges onto a bend in a drive/track, keep to the right and go through the gate (SJ1210468963). This is a good place to stop as there is a fallen tree which can seat several people and you are only about 50yds short of the highest point on the walk. Continue along the path then, just as the path starts to bend to the left, take the lesser path off to the right (SJ1205768884). (If you are still on the main path when you the land on the right becomes enclosed, you have missed the path. Look down the hillside and you should be able to see the intended path about 20yds below the main path). Stay on the lesser path to emerge, after 0.7mile, on to a lane (SJ1186168135) and turn right. At the T-junction go left, then after 200yds take the signed footpath, to the right, at Gelli Bugail. Follow the path, across the fields and past Gelli Farm, for 0.5 mile, then turn left onto the lane at Berth Farm (SJ1110668624). After 800yds look for a house on the right Bryntirion Ucha, then be vigilant looking for the footpath sign through the garden of the next house, Clwydfryn (the footpath sign and house name can be easily missed when coming down the hill). The footpath enters the garden from parking area then turns right to a stile. Follow the footpath across the fields, for just over 0.5 miles, to emerge onto the lane at Tyn Y Celyn (SJ1024669206). Turn left to retrace your steps back down the lane then left at the T-Junction and back to the start.